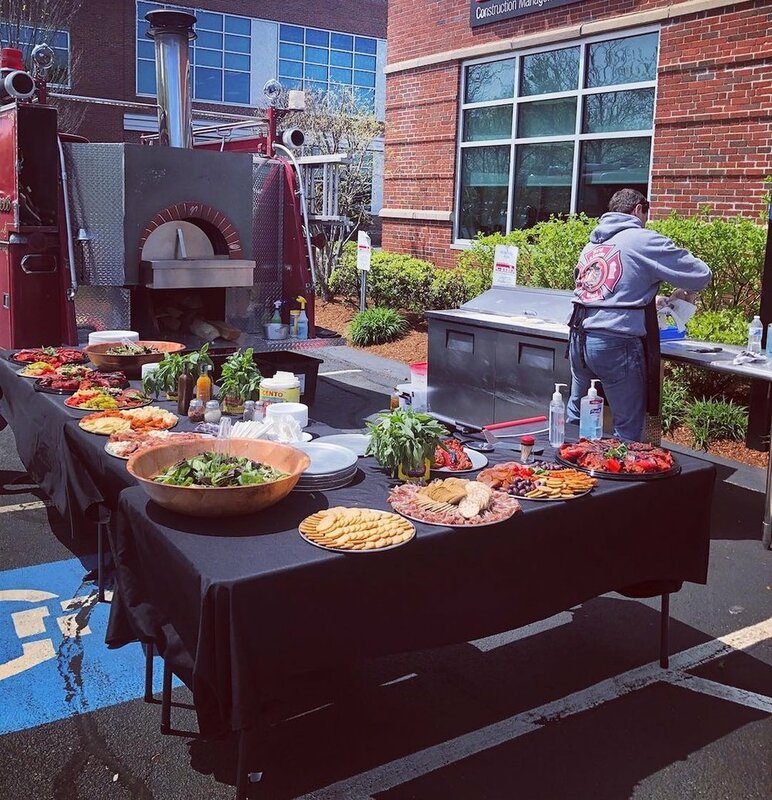 Pizza made on a fire truck. Our truck transforms your driveway into a pizza kitchen! We create hot, fresh, delicious pizza, right from the wood fired oven on our fully restored 1968 Mack fire truck. Google, Social Media, Word of Mouth etc. Want to see what we've got going on? Come join us at any of our public events. I cannot say enough great things about Kevin and his food truck! We recently had my son's second birthday and decided to do something different than your traditional BBQ. Kevin was on time, professional in his setup and ready to go as soon as guests started to arrive. Not only is the excitement of seeing a firetruck great but the pizza was even better! My son, as well as all his little friends loved seeing the truck and climbing up in it. Kevin kept the pizza flowing and everyone satisfied. Having a father who owned his own pizza shop for over twenty years calling up his brother (my uncle) who also owns his own shop, to come over and try the pizza tells you something (and Italians are very particular about their pizza). I cannot say enough great things and I highly recommend renting out this pizza truck! You won't be disappointed! Incredibly unique and the pizza was amazing. We threw a party for 30 kids (20 adults) and everyone loved the pizza. Kevin and his crew were clean, professional, courteous and great with the kids. I'm recommending them to anyone that wants to do something different from the traditional backyard BBQ. We can't rave enough about how great everything was! Kevin and his crew were professional and personable and the pizza was delicious. They came with their truck for a party of about 60 adults and kept the pizza and wings continuously going all night, ending with their amazing s'more dessert pizza. They took care of all the set up and clean up...the easiest party we've ever had! Can't recommend them enough! This was the best birthday gift I could give to my grandson! He didn't want to leave the front seat of the fire truck! Pizza was amazing, delicious, fresh ingredients. Thank you, Kevin, for going above and beyond. Thank you so much. It was a great day and the pizza and the guys were awesome. We had many, many compliments. I am counting the days to when we can have you back again. You have a fan for life. We hired 3rd Alarm for our son's 2nd birthday party. They were great! Everyone loved the fire truck concept and their pizzas are delicious. Kevin is definitely dedicated and passionate about his business and customer service. The crew arrived early and gave themselves plenty of time to setup and fire up the oven before our guests arrived. We would absolutely recommend using these guys to cater your event and provide an entertaining twist with the trucks, lights, hats and fun! They came to birthday party for Mother, Great band, Irish dancers fabulous and the amazing pizza. The guys were very sociable, everyone loved the pizza, we sent the leftovers home with guests and I have been getting messages overnight about how great the pizza was cold. Nice job guys! Unbelievable how great they were.... I just want a party to hire them! My son is a Boston Firefighter, I told him he needs them at his next party!!!! Huge Shoutout to Kevin and his crew for an amazing addition to our Annual Ward 8 Halloween Celebration in Malden. The Fire Truck was the highlight of the evening and the pizza was delicious. With a crowd of over 300 people you moved the line right along! Thank you so much for feeding us all. Can’t wait to book you for another one of our many community events.